Queen honey bees are created when worker bees feed a single female larvae an exclusive diet of a food called “royal jelly“.Queens are produced in oversized cells and develop in only 16 days; they differ in physiology, morphology, and behavior from worker bees. In addition to the greater size of the queen, she has a functional set of ovaries, and a spermatheca, which stores and maintains sperm after she has mated. Apis queens practice polyandry, with one female mating with multiple males. The highest documented mating frequency for an Apis queen is in Apis nigrocincta, where queens mate with an extremely high number of males with observed numbers of different matings ranging from 42 to 69 drones per queen.The sting of queens is not barbed like a worker’s sting, and queens lack the glands that produce beeswax. Once mated, queens may lay up to 2,000 eggs per day. 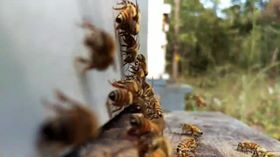 They produce a variety of pheromones that regulate behavior of workers, and helps swarms track the queen’s location during the swarming.